ENC-300-HDSDI - H.264 (MPEG-4) HD/SD Encoder with HD/SD-SDI input | AdvancedDigital Inc.
Realtime Encoder-Blade with HD/SD SDI (embedded Audio supported), PAL/NTSC, Composite, S-Video, Component, or analog VGA (RGB) input, incl. Breakout cable “S” for encoding/transmitting ISO-compliant H.264 HD/SD transport streams. Compatible to PC XPlayer, IPTV set top boxes and the iCue Live and VOD Streaming Server. The ENC-300-HDSDI encoder is designed for LIVE streaming applications where single TV channels, CAMERA signals or MONITORING feeds are distributed or published on a network or the internet. The ENC series provides real-time compression of video and audio inputs. The ENC series create and transmit video streams inside LAN and intranet networks. Input video/audio signals on an ENC encoder and view these streams directly -via network- on PC’s, TV’s or other display devices. 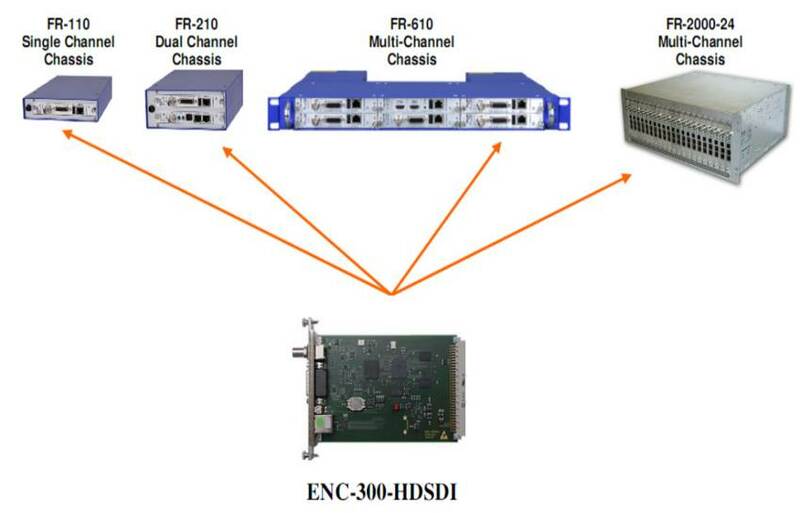 The ENC-300-HDSDI is a compact, low cost H.264 SD/HD video encoding and LIVE streaming blade. The ENC-300-HDSDI encoder process input streams from D1 up to Full-HD resolution for professional MPEG-4 AVC H.264 SD/HD streaming to any kind of device. ENC-300-HDSDI encoder blades are built for robust 24/7 LIVE encoding operations and can be used in tough environmental conditions. They are designed without any moving parts, making them disk-, fan- and noiseless. Professional quality & Easy configuration: ENC-300-HDSDI encoders incorporate low-latency compression technology and professional signal processing, creating full resolution video streams in HD or SD resolution. To access the intuitive graphical user interface use your standard web browser from any PC on the network, no special or additional tools are required. Remote network configuration is also supported over SNMP* and serial control over the local Comport. TALKBACK audio conferencing, integrated COM* server and GPIO: The ENC-300-HDSDI supports TALKBACK*. This allows audio conferencing and communication between encoder standpoint and viewer. TALKBACK to ENC encoders is supported by PC’s, as well as from the DEC decoder series. The Comport* supports remote control of PTZ cameras and other peripheral serial equipment through it’s integrated a switchable RS-232/RS-422 port*. The GPIO* interface enables contact closure function from the web GUI or pass thru from a decoder. Extremely robust and durable: The encoder blades are designed without any moving parts to ensure system uptime, reliability and noiseless operation. Blade based operation: The ENC-300-HDSDI blades are operated inside the FR Chassis Series. Blades can be used in a single channel chassis (FR-110, factory mounted). High-density requirements are solved by operating the ENC blades in the 1 RU FR-610 multi-channel rack, which can hold up to max. 6 Teracue blades. The 4 RU FR-2000 can hold up to 11 ENC-300 blades. Different types of ENC encoder blades and DEC decoder blades can be “mixed and matched” inside the FR-610 and FR-2000 chassis. FR-110 – Single channel blade chassis. FR-210 – Dual channel blade chasis.